Oh, Mexico lindo y querido! People usually ask me “isn’t Mexico dangerous?” when I tell them I used to live there. My answer, “not at all, the people are the sweetest, the food is the best and the landscapes are out of the world”. My advice, rush to visit! I originally wanted give you an itinerary for two weeks in Mexico but seeing how long this post about Mexico city is, I don’t want to overwhelm you with too much information! I will upload the rest of the road trip at the weekend. I recommend to spend 3 days in the capital to see all the basics. Visit the Zócalo, one of the biggest main squares in Latin America, which was the epicentre of Tenochtitlan, the ancient name of Mexico city at the time of the Aztecs. Next to it you have the remains of the Templo Mayor (one of the main temples of the Aztecs), which also often welcomes Indian dancers who can purify you and a small market. You also have the Palacio nacional (the National Palace) which is worth the visit with amazing murals from one of Mexico’s most famous painter, Diego Rivera which display the history of the country. The cathedral, on the other corner of the square is of course another must-do, especially if you are lucky enough to be there on time for the mass. Be careful if you walk around, the neighbourhood behind the National Palace is not the safest. This will take you around 3-4 hours, after then you can go through the Calle de La Moneda with its lovely colonial buildings and trendy shops to go to the Palacio de Bellas Artes, a magnificient building which is now used as the National Theatre. If you have the time, you can also go to La Ciudadela, a market to buy souvenirs. Mid-afternoon, hop onto a taxi and go to Coyoacán, one of the city’s historic centres to visit the Museo Casa Frida Kahlo. The artist’s life and perspective on it is truly inspirational. The museum used to be Frida Kahlo’s house and has a photogenic garden, full of cactus. Check the times before going, they usually close at 5:45pm and on Mondays. You can also have diner in Coyoacán, which is one of the best places for street food. I unfortunately do not remember any particular restaurant but this link might be helpful. Please have some tacos, gringas and quesadillas for me, I miss those too much! Start your morning with the Museo Nacional de Antropología (the National Museum of Anthropology, one of my favourite in the world (with the Natural History Museum in NY!). The courtyard itself is an architectural beauty but the many rooms are really interesting too. You can easily spend the day there, even if you’re not a fan of museums. It holds a great reproduction of Tenochtitlan, the original Aztec Sunstone (probably the most famous Aztec sculpture, the calendar stone), a reproduction of Moctezuma’s feathered headdress but also different scenes of daily life in ancient Mexico, among others! 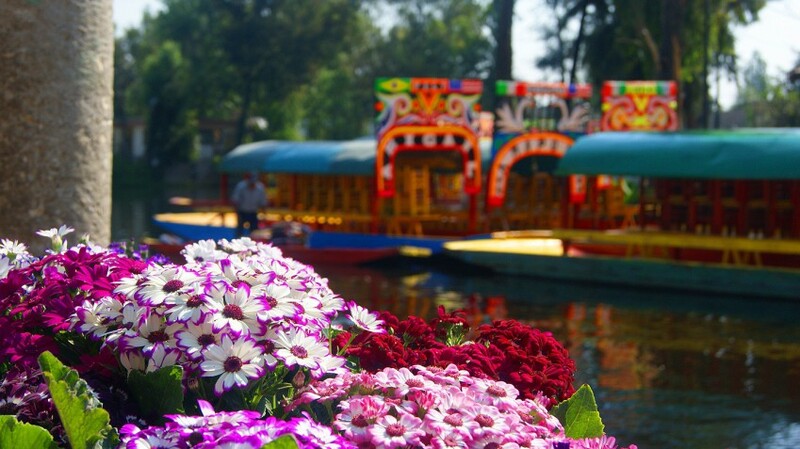 In the afternoon, visit the Floating gardens of Xochimilco. You will board a typical wooden flat boat to be guided down the canals with other people, who might take a mariachi band for the ride. The experience is even more surreal with a bottle of tequila! Spend the evening in Plaza Garibaldi , close to the Palacio de Bellas Artes with the mariachi bands. They also have a night market, full of street food vendors. Make sure you get up early to go to the surreal ruins of Teotihuacan. They usually open at 9am whereas tour buses arrive later. Several times, I have been lucky enough to start the visit right when they opened which means we were on our own in the ancient city ruins. If that’s of interest, you can also hop onto a hot air balloon above the pyramids. The Pirámide del Sol (Pyramid of the Sun) is the world’s third largest pyramid. It is quite a hike but make sure you climb it for amazing views of the whole area! At the end of the visit, you can also go to the museum (the entrance fee is included in the ticket) which stores artifacts found during excavations. Before going back to Mexico city, you can grab a quick bite at La gruta, a unique restaurant in a cave. To go to Teotihuacan, you can simply take a bus at the north bus terminal, they have buses leaving every 30 min and you can see Mexico city’s surroundings and sadly, slums. Late morning, you can go visit the Castle of Chapultepec, which was the residence of Emperor Maximilian I of Mexico and showcases a few rooms as they were during his reign. From the Castle, you also have amazing views of the city and the Zócalo, with its giant flag. In terms of hotels, I’ve always stayed at the Hotel Metropol The location is great: a short 10-minute walk to the Zócalo, cheap and surrounded by restaurants. In Mexico, street food is available at every corner. You can enjoy quesadillas, tacos, carne asada, gringas, tortas, tostadas,… Some of the traditional Mexican dishes also included pozole and enchiladas, which are best in restaurants. If you cannot cope with spicy food, make sure you ask them to make it not spicy at all as our spiciness standards clearly aren’t the same! In terms of drinks, two very popular traditional drinks are agua de jamaica and agua de horchata. I personally hate the agua de horchata (the water from the rice) with all my guts but could drink the agua de jamaica (hibiscus tea) forever, try both for a real experience! If you like the agua de jamaica, you can buy the hibiscus flowers in local markets to bring it back home with you. Another very nice area for diner is La Condesa, a trendy neighbourhood full of expats, artists, quirky bars and restaurants but also full of life! If you’re hungry, I recommend walking around for 5 min and just pick a restaurant. Next up: Oaxaca, Monte Albán, Palenque, Agua Azul, Misol Ha, Mérida and Tulum! ps: Amigos Mexicanos, si leen este articulo, no duden en mandarme sus recomendaciones! Un abrazote desde Londres, los espero! Previous New York, where dreams are made of. Realmente es lo más lindo que existe! !